"A very social and useful web browser!" The internet browser market is a monopoly and Google Chrome is owning it right now, with Firefox and Internet Explorer right there on its tail. With the market so controlled and hard to get into, one would think that there is no room for yet another web browser. Especially when the middle layer is not that bad; you have Safari, Opera, and Maxthon to thank for that layer. They have some market share, but not a whole bunch. And then you have the bottom - the entry level. Every now and then we come across a browser that claims to do "this" and "that," but they usually fail because nobody pays them much attention. That is not the case with the Torch Web Browser and it doesn't seem to be going away anytime soon. Especially with over 1 million users. And for good reason. The browser does one thing natively that other browsers have yet to do; the browser integrates with the Facebook social media giant. 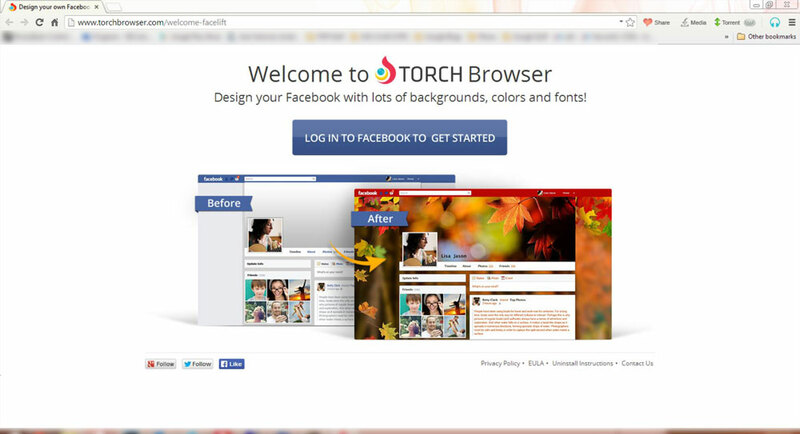 Torch Browser users are able to change their backgrounds on Facebook and see the background designs of other Torch Browser Facebook users. I'm not talking about the Facebook Cover Photo. With Torch browser you can do away with all of the blue on Facebook and Myspace it up a little bit. Cool right? But that's not all. Torch Browser also comes stock with a torrent client. And a very good one at that. You can easily download torrents straight to your downloads folder from within the browser. There's no more need for a third party torrent client.